We hope your holidays were merry and bright! As we have for decades now, we gathered with family to celebrate and ring in the New Year on our beloved St. Barth. This year was even more special, as the whole island had something extra to celebrate – an amazing recovery from Hurricane Irma. The esprit de corps remains strong and is as beautiful to see as the tropical flowers that are blooming again. One of the harbingers of the Festive Season has always been the arrival of Roman Abramovich’s 538-foot yacht. So we were pleased to see the Eclipse pull into the harbor! And the pièce de résistance? Jimmy Buffet treated everyone to a free — and fabulous — concert on the quai. What fun! 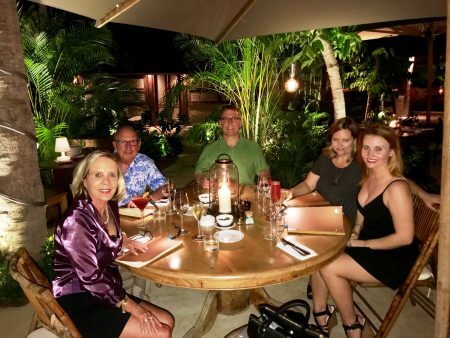 We loved dining again at our favorite restaurants and savored our Christmas dinner at Le Tamarin. We were thrilled to see Orega up and running, looking fabulous and boasting a new sushi bar. Shellona reopened with great fanfare on popular Shell Beach. Some of our family members secured a coveted lunch reservation and raved about the Greek-influenced cuisine. And most of all, I loved seeing everyone again enjoying our gorgeous beaches. Happy New Year, and I hope to see you on the island. P.S. 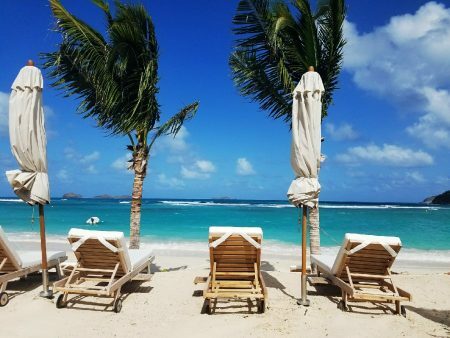 Keep updated by subscribing to my blog – and we’d love to hear about your St. Barth vacation. This perennial favorite is as romantic as can be and is now available with the special offer of a 20% price reduction. Come Value Season (April 16 – December 14), Rocamadour participates in our popular Drive, Dine & Relax package. Weekly rentals during that period come with a complimentary car rental and dinner prepared and served in the villa by one of the island’s private chefs. Terraced into the lush hillside of Colombier, this pretty – and private – 1 bedroom villa is perfect for honeymooners and is the quintessential romantic getaway. Its main level encompasses a well-equipped kitchen, a dining area, a comfortable living room and a guest bath. A poolside covered patio is perfect for dining alfresco. Upstairs the en suite bedroom is graced with a king-size 4-poster draped bed and features a private terrace for taking in the breathtaking views of Flamands – and star gazing. Its location within walking distance of the 5 star Hotel Villa Marie and its elegant restaurant François Plantation is a nice place to be! Enjoy a gourmet dinner and walk home. Villa Marie also offers poolside dining at lunchtime, and the wine is always chilled to perfection. Congratulations to St. Barth Properties President Peg Walsh for again making the annual Wendy’s WOW List – for 2018. Travel planners qualifying for this prestigious listing are chosen for their expertise in a specific destination or vacation niche – and their outstanding customer service. If you are looking for a feet-in-the-sand lunch or a relaxing afternoon seaside with a chilled glass of rosé, try the new Lil Roc Beach Bar on St. Jean Beach. Comfy-as-can-be chaise lounges are available for €35. Reserve ahead with our own island concierge Aurélie Janvier. And enjoy! We are pleased to share that the 5 star Hotel Christopher St Barth will re-open on February 20, 2018. The 42 rooms and suites at the hotel have been entirely renovated, and we are ready to book one of them for you. Spa Sisley, where the treatment rooms open to the ocean, has been updated, and there’s a new fitness room with the latest equipment. The super-sized infinity pool has been relined with mosaics. Restaurants Taïno and Mango have been entirely reimagined and guests will love Chef Nicolas Tissier’s creative cuisine. This striking three bedroom villa compound incorporates a contemporary take on traditional West Indies design and is beautifully landscaped. The main house has a spacious open floor plan and two en suite bedrooms. An expansive pool deck includes a gazebo and provides ample outdoor living space. A separate one bedroom villa (with an uber-glamourous bathroom) has an open-air kitchenette, an adjacent covered dining terrace and a circular plunge pool with bench seating. The compound’s additional features include a fitness room. 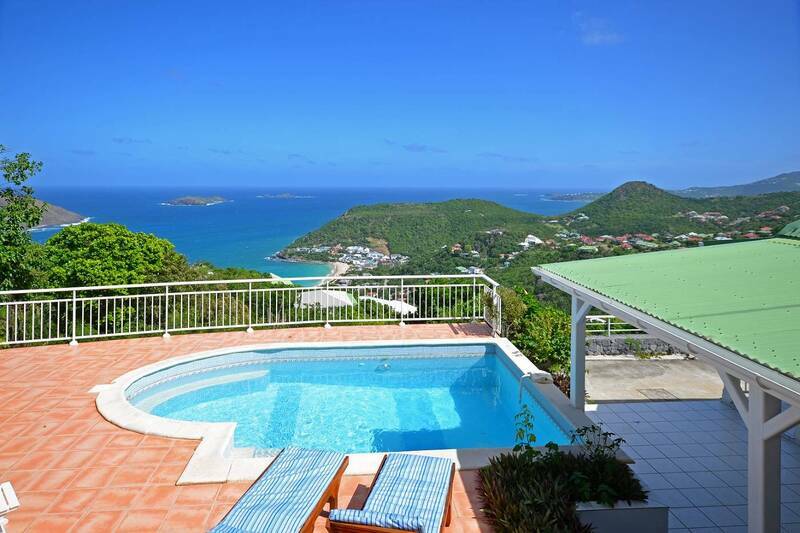 The views of Gouverneur Beach and the island’s verdant hillsides are breathtaking. No photos could capture the serene beauty that the view of Villa Azur affords. . . It provided the foundation for the most relaxing vacation that Tony and I have experienced. 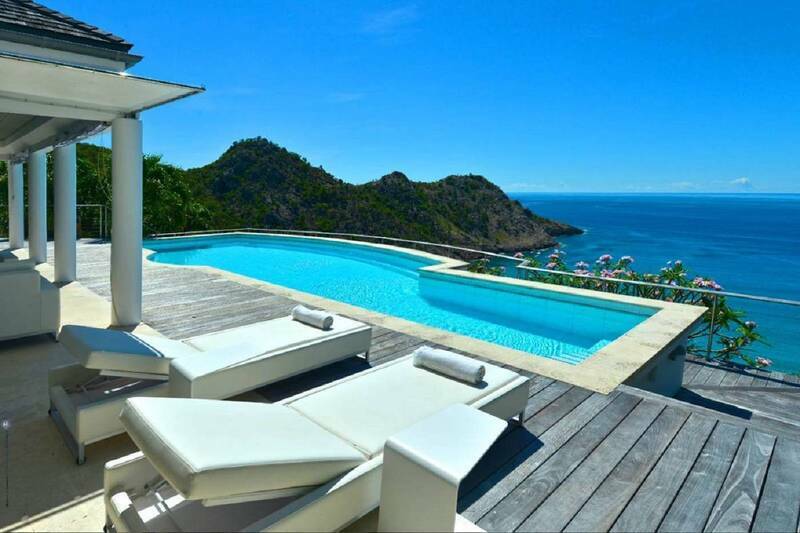 Your associates in St. Barth could not have been more professional or helpful. It was very reassuring to know that they were only a phone call away. Again, many thanks. I’m confident that you will be hearing from us in the future.